My mother Britt-Marie always has had dogs. When I was newborn she had a Long-Haired Dachshund called Mitzi. Unfortunately Mitzi was run over by a car at my second birthday. Then my mother got a Yorkshireterrier-puppy as a present from my father. She also bought a Maltese. In 1972 she bought our first chihuahua from Swedish kennel Kronbackens. His name was Kronbackens Baron Brizard, but we called him Musse. He was a lovely little dog. But he only got one testicle and in Sweden it was and still is not allowed to show or breed from a dog with only one testicle. Therefor she gave him to a friend so that we could see him often. He lived until he was almost 16 years old. 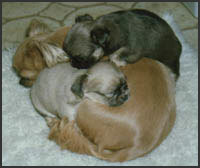 My mother started breeding Yorkshireterriers and I helped her show them. But I could never forget that little chihuahua. In 1981 I met Chihuahuabreeders Jonas Jonasson and Gunnar Julenius kennel Blåklockans at a show. I fell in love with their MULTICH Apoco Deodar Kingfisher and CH Blåklockans Marionegra. I wanted a puppy from those two, but unfortunately Marionegra didn't get puppies. Instead Marionegra's sister MULTICH Blåklockans Miss Mario got puppies with Kingfisher on 12th April 1982 and I bought Blåklockans Juanita from that litter. She became SCH and her only two puppies (by MULTICH Brujay Mario of Apoco Deodar) Tiddy's Mr Sandman and Tiddy's Miss Sandy both became champions. They were born 8 October 1984. In 1985 my mother and I got the prefix Tiddy's. 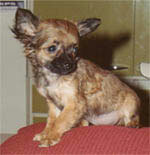 In the last few years there have been registered 1-3 chihuahualitters each year with our prefix. Our dogs live as familymembers. We now have very fruitful co-operation with kennels Misty Meadow's in Italy, De'Achachilas in Finland, Pequeno in Denmark, Alea's and Wayra's in Sweden.